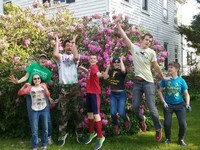 You're invited to hang-out with the New Hope Youth Group! We meet every Sunday from 5:30 to 7:00 PM upstairs in the fellowship hall. We have a lot of fun during this time together. Our purpose in meeting is to grow closer to Jesus by spending time together, studying the Bible, praying as a group, and serving those in need. We also have a variety of special activities throughout the year that allow our students to take an active role in the church and our community. Grades 6th through 12th are always welcome. "I like coming to youth group because it's fun!" "I like the educational experiences." "It's a lot of fun and I enjoy the Bible studies." "It's great being with friends and learning about God." "Youth group expands our identity and who we are as Christians." "I like coming to youth group because we eat good food and learn about God."